Join our tutor, Richard Donayou, for two days of training in this traditional skill. The course teaches the basic principles of dry stone walling which will involve hands on setting out and building. 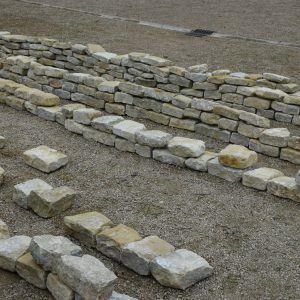 At the end of the course, you will have a good knowledge of the history of local walls, an understanding of the tools to use and the skills to set out your own wall and lay stone proficiently. Enjoy working at your own pace in a structured but informal atmosphere. 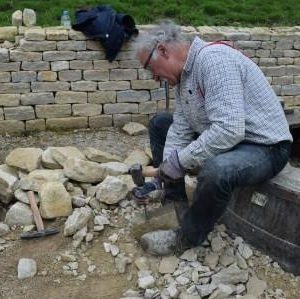 Our Beginner’s Dry Stone Walling workshop will run on two separate dates in 2019: Saturday and Sunday 9-10 March and Thursday and Friday 21-22nd March, from 9:00am till 4:00pm. There are just 7 spaces available on each two day course, which costs £125 per person. experience in hands on setting out and building. You should be reasonably fit and healthy to complete this course. Stone walling does not require great physical strength. It is suitable for those aged 16 or over. Under 18s must be accompanied by a paying adult. If you have any medical conditions which you think that your instructor should know about, you should inform him. Serious injuries in walling are rare, but care is needed when handling and working with stones to avoid back, hand, feet and eye injuries.